This recipe combines some of my favorite ingredients in a tasty twist on chicken salad. Plus, presenting in these awesome, easy-to-make tortilla bowls is the best way to fool your diners into thinking you’re a master chef. 1. Heat oven to 400°F. Spray insides of 4 ovenproof 2-cup soup bowls with CRISCO® Original No-Stick Cooking Spray. ** Set aside. 2. In food processor bowl with metal blade or blender, place all vinaigrette ingredients except oil. Cover; process until smooth. With food processor running, slowly pour oil through feed tube until mixture is thickened. Set aside. 3. Spray 1 side of each tortilla with CRISCO® Original No-Stick Cooking Spray. Sprinkle cumin and 1/2 teaspoon salt evenly over sprayed sides of tortillas. Press tortillas, seasoned sides up, in bowls. Place bowls in 15x10x1-inch pan. 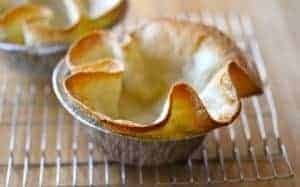 Bake 5 to 7 minutes or until edges are golden brown. Remove tortillas from bowls; place upside down on cooling rack. Cool completely. 4. In large bowl, mix chicken and 1 1/3 cups mango. In small bowl, mix 1 tablespoon lime juice and the avocado. Add avocado and remaining salad ingredients to chicken mixture; mix well. Add vinaigrette; mix well. 5. 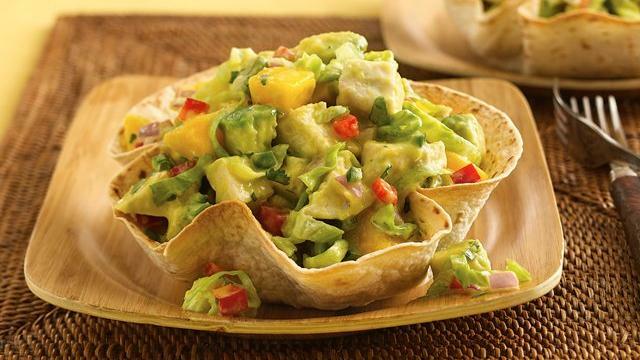 To serve, spoon chicken salad into tortilla bowls. (Bowls will be full.) Serve immediately.